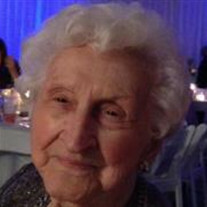 Mary Plaso (nee Elkovich) age 95 of Elyria Township, passed away peacefully on Tuesday, August 15, 2017 at O'Neill Healthcare in North Olmsted. Born December 4, 1921 in Helvetia, Pennsylvania, she moved to Lorain in 1937 and then to Elyria in 1956 where she has lived since. Mary was a homemaker who enjoyed playing bingo, baking, cooking and watching Cleveland sports. Surviving are her children, Daniel (Linda) Krasienko of Grafton, Linda M. (Patti Verde) Krasienko of Westlake, JoAnne Craig of Lorain and Joseph (Kim) Plaso of North Olmsted; grandchildren, Adam (Erin) Craig, Erin Craig, Jason (Tracie) Krasienko, Lisa (James) Krasienko-Schramm, Michael Krasienko, Erica (James) Shields and Tyler (Jackie) Plaso; great grandchildren, Jordan Krasienko, Angelina Krasienko, Robert Krasienko, Carter Plaso, Spencer Plaso, Luke Craig and Wren Craig; and a sister, Anne Murdaugh of Islandton, South Carolina. She was preceded in death by her husband of 41 years, Joseph John Plaso in 1996; parents, Stephen and Anna (Troyan) Elkovich; brothers, Adam, Stephen, Frank, John and Michael; sisters, Helen Elkovich, Margaret Elkovich, Anna Elkovich, Mildred Elkovich and Kathryn Sustersic; and her son in law, Timothy Craig. Visitation will begin on Monday, Aug. 28th, at 2:00 pm, with services following at 3:30 pm in the Dovin Funeral and Cremation Specialists, 2701 Elyria Avenue, Lorain. Mary's daughter, Rev. Linda M. Krasienko along with Rev. Patti Verde will officiate. Burial will follow in Calvary Cemetery. To send online condolences go to www.dovinfcs.com.